You shouldn’t ignore your squeaky floor! Sometimes, parts of your flooring that aren’t supposed to move will move. Whether it’s a loose nail, or a loose board, if something isn’t supposed to move and it does, this can cause squeaking. 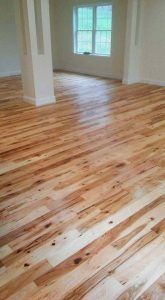 Whether it’s the dead heat of summer or the frigid cold in winter, extreme temperatures can cause wood floors to be noisy. In the cold of winter, the wood will contract and be smaller because of the low humidity. On the other side of that is in the summer heat and humidity, the wood will expand. To prevent winter shrinkage and squeaking due to lack of humidity, consider investing in a humidifier that will keep your home’s relative humidity between 35% and 55% and keep your floor happy (and quiet). Sometimes, where two boards meet they can shift just the right way and cause squeaking. This type of squeaking is usually pretty easy to spot because it is localized to a specific area and you can spot the movement. Some homeowners have had success keeping the noise down by sprinkling baby powder on the affected area. If you find the squeaking is happening in whole sections of flooring and not just localized to specific spots, your problem might be in the subfloor. You’d be walking from one section of squeaky floor to another. Squeaking is a perfectly normal part of living with hardwood flooring. If you notice that your floor is squeaking, listen to it to try and figure out the reason. The first step is checking the relative humidity inside of your home. If the squeaking keeps going for more than one season, Try and find out what type of movement is happening. Depending on what’s going on, there are some pretty easy fixes. If you need another set of eyes (and ears!) to help you figure out what’s going on with your floor, contact Jason Brown Wood Floors today! Depending on what the issue is, there are a variety of fixes out there. If your floor is creaking there’s probably a reason and you should listen to it and fix whatever needs fixing before you run out of time and it becomes a worse problem. This entry was posted on Friday, July 28th, 2017 at 6:28 pm. Both comments and pings are currently closed.